The Manager’s Dilemma: Which Species to Monitor? Imagine you’re the manager of a national park. One that’s rich in endemic biodiversity found nowhere else on the planet. It’s under the influence of multiple human pressures causing irreversible declines in the biodiversity, possibly even leading to the extinction of some of the species. You’re working with a complex system of multiple species and threats, limited knowledge of which threats are causing the biggest declines and limited resources. 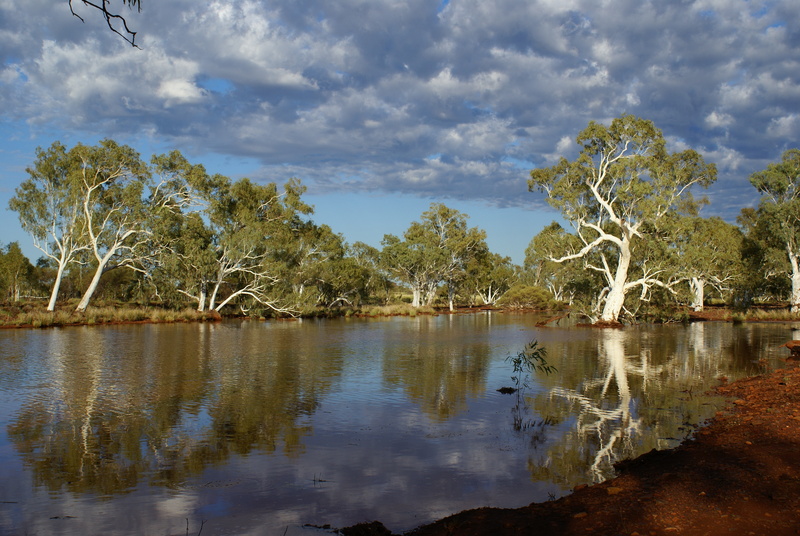 How do you decide what course of action to take to conserve the biodiversity of the park? This is the dilemma faced by biodiversity managers across the globe. In our recent paper, ‘Quantifying the value of monitoring species in multi‐species, multi‐threat systems’, we address this problem and propose a method using value of information (VOI) analysis. VOI estimates the benefit of monitoring for management decision-making. Specifically, it’s a valuation tool that can be used to disentangle the trade-offs in competing monitoring actions. It helps managers decide how to invest (or whether to invest) their money in monitoring actions when faced with imminent biodiversity declines and the urgency of efficient conservation action. Picture the world’s most ancient natural landscape. 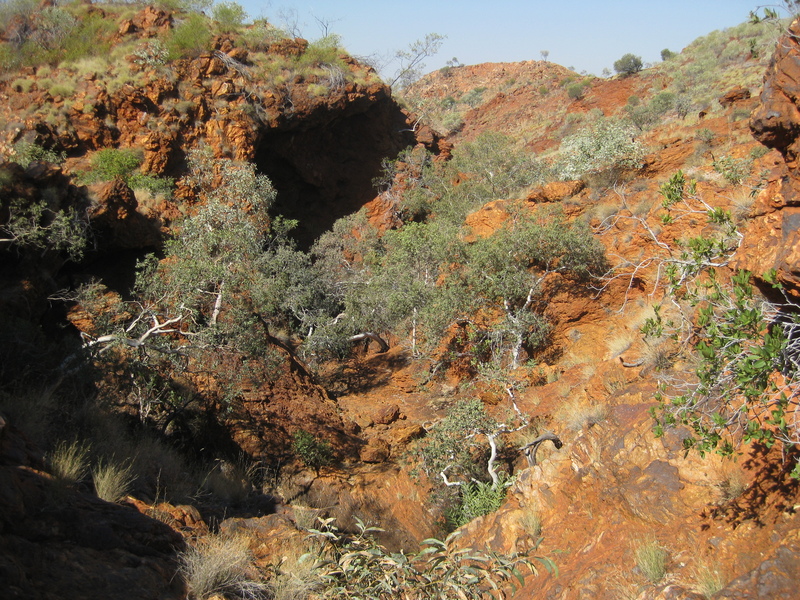 Over 500,000 km2 in north Western Australia, with deep red soil, extensive arid coastal plains, rolling spinifex grasslands on inland mountain ranges and deep gorges: the Pilbara. Home to many an endemic plant and animal species found nowhere else on earth, this arid landscape is also known for its vast mineral wealth (iron ore in particular). Early settlers of the Pilbara were livestock farmers. As a result, most of the region is now pastoral land and has populations of feral and domestic ungulates and herbivores. Mining has since become a significant industry, with the Pilbara being recognised as the ‘engine room of Australia’ today. These activities, along with increasingly frequent wildfires, have irreversibly altered the vegetation cover and soil profile of the region. Today, this area’s iconic biodiversity is under growing pressures from invasion by exotic plants and animals, predation by feral predators and altered hydrological and fire regimes. Now put yourself in the shoes of a manager faced with the huge task of conserving the biodiversity in a national park within the Pilbara. You want to manage the existing threats so that you can reduce biodiversity declines. Unfortunately, you have limited knowledge of the impacts of threats on species and limited resources at your disposal. Ideally, you’d like to know what the best course of action would be, one that best utilises the resources available to you and helps you implement actions that improve management outcomes for the target biodiversity/species. But this is not straightforward. You need to know about the impacts of multiple (often interacting) threats on biodiversity to be able to choose the most appropriate threat management actions. 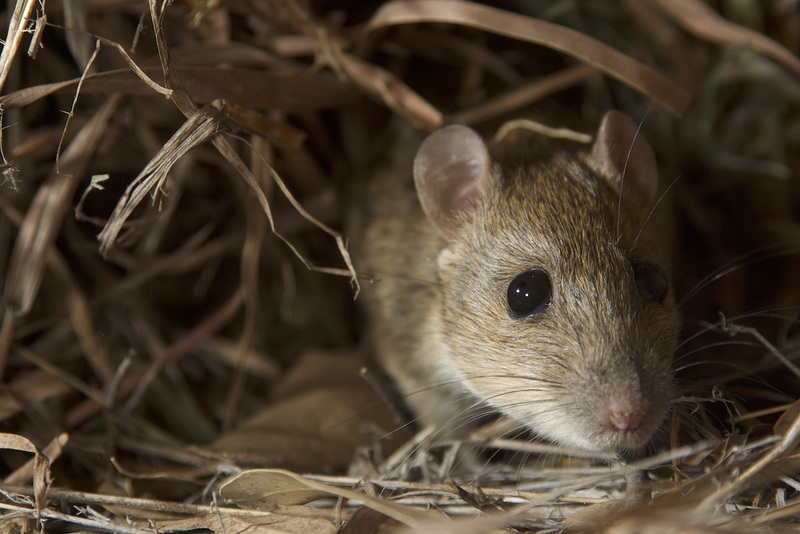 Not only do you need to take stock of the most vulnerable species, the multiple threats that are impacting these species, the effect that your management actions might have on the species, but you have to do so under a limited budget. You could monitor the threats directly, but that won’t necessarily tell you about what is happening to the biodiversity you care about. It also won’t tell you which threats impact which species and how. If you monitor the species, they’re what you care about after all, will you learn anything about the threats? And if so, which species would give you the most useful information to help make threat management decisions? There’s also the option of adopting different monitoring strategies. Targeted monitoring – using an experimental or control design to manage some of the threats and then monitor to determine which observed declines are linked to which threats – is one example of this. Surveillance monitoring without experimentation would also be an option. Given all these choices, how would you pick the best decision when you don’t have enough budget to do all that you want to do? Value of information (VOI) has been widely used to enable risk management decisions in the fields of business and health. It’s a method that evaluates the benefits of collecting additional information to reduce uncertainty in a specific decision-making context. A key concept of the VOI is the expected value of perfect information (EVPI). This is the difference between the expected outcome when decision is taken under no uncertainty (i.e. when we assume we obtain perfect information from monitoring) and the expected outcome under uncertainty (i.e. before monitoring). Obtaining perfect information is unrealistic though. So, a more useful metric is the expected value of sample information (EVSI). This metric estimates the benefit of reducing, rather than eliminating, uncertainty. The idea here is that monitoring influences the management decision and VOI helps evaluate how much closer we come to our desired management outcomes as a result of the additional information (from monitoring). For the sake of explanation, let’s assume that species are being driven to extinction because of threats and that we can save them by managing the threats. Based on a management decision taken before monitoring, we save no species and a decision taken after monitoring helps us save 2 species. In this case, the value of information will be 2 – the difference between the outcomes. It can also work the other way around though – we might save the same number of species irrespective of whether we monitor or not. In that case, the value of information is zero. By using VOI, we can compare the value of different types of monitoring strategies for decision-making and identify the type of strategies that provide information leading to the best biodiversity outcomes. 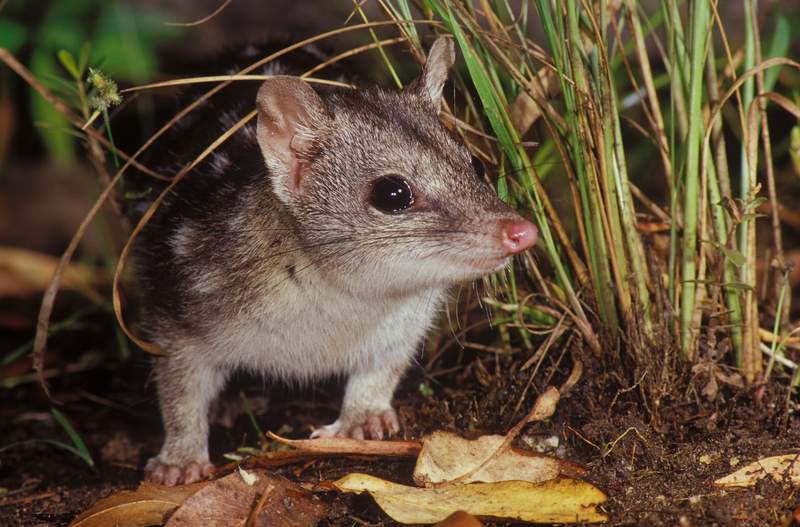 Using an existing region-wide assessment of management strategies for mitigating the effects of multiple threats on Pilbara’s biodiversity, we selected three co-occurring target species: the greater bilby (Macrotis lagotis), the northern quoll (Dasyurus hallucatus), and the pale field-rat (Rattus tunneyi). We also considered two threats prevalent in the region: increasing fire frequency, and over-grazing due to feral ungulates and domestic herbivores. On top of this, we imposed a management constraint on ourselves: a fixed budget that’s insufficient to manage both the threats. As well as this, we had a monitoring constraint that only allowed us to only monitor up to two species. We obtained prior information on threat probabilities and species persistence estimates under a fire management strategy, and a combined feral ungulate and domestic herbivore management from the published literature. Within the targeted strategy we could even compare the EVSI of the type of experiment adopted: i.e. managing grazing versus fire (as indicated by the solid versus the dotted lines). VOI also helped us to identify monitoring strategies that weren’t informative for decision-making. We found that surveillance monitoring provides no benefit for decision-making for the Pilbara, given the decision context. Such insights are essential to help avoid wasteful spending on monitoring programmes. Managers can instead invest directly in management actions. 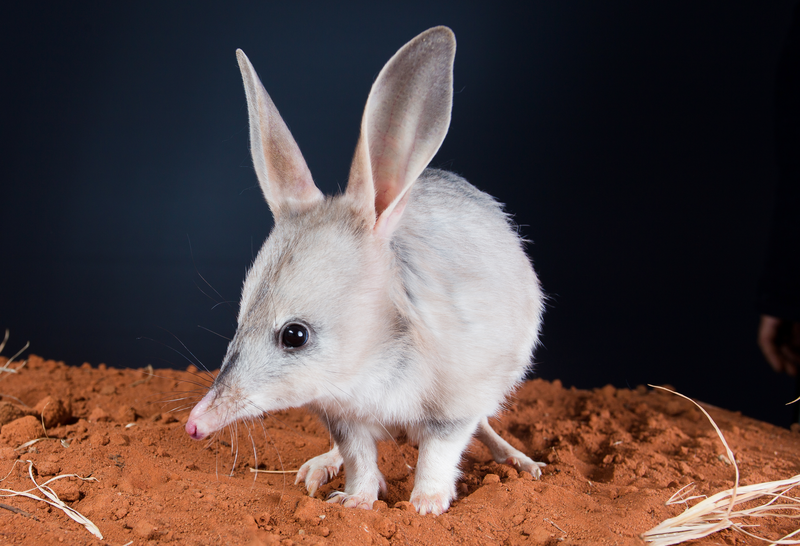 Under the targeted monitoring strategy, where the manager can experimentally manage some of the threats in the system to learn about their impacts on the species, our approach showed that the greater bilby was the best species to monitor. We also found that managing grazing was the optimal experiment to learn about the threat impacts. 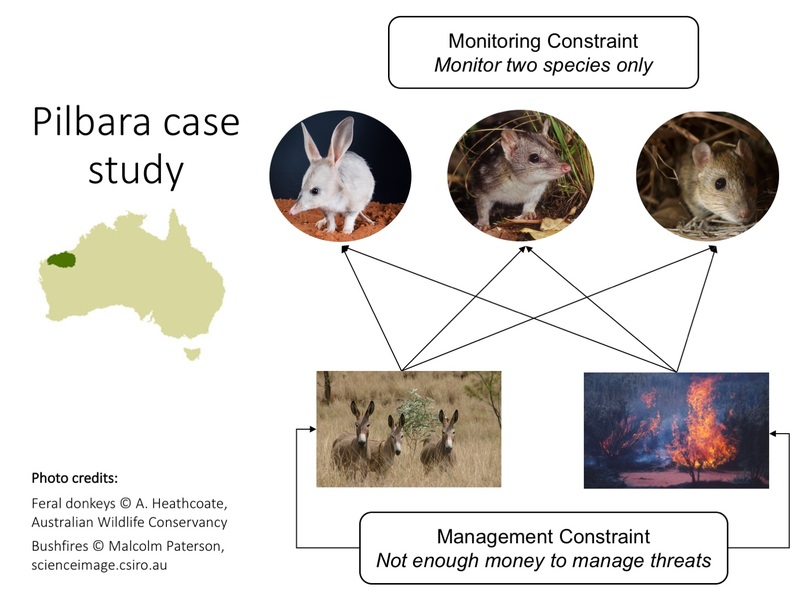 There can be cases, however, where the optimal monitoring strategy (species and the experiment) can change with the budget available for management (see the Fitz-Stirling case study in our paper). The best species to monitor at lower budget levels may not be best at higher budgets. Again, this is important information for managers when deciding how to allocate the limited available resources to monitoring. 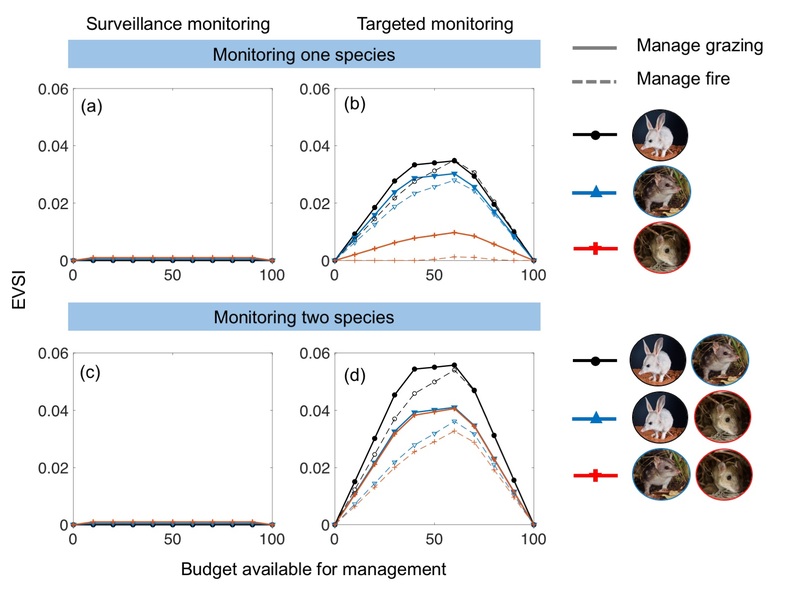 Overall, our study showed that the best monitoring strategy can change with the budget available for management, the different impacts of threats on species, and the relative costs of managing threats. It is crucial for managers to explicitly consider a range of decision parameters when deciding which species to monitor to inform real-world conservation decisions. Our novel VOI approach allows managers to do this and provides general rules for selecting monitoring strategies based on the decision context. To find out more, read our Methods in Ecology and Evolution article ‘Quantifying the value of monitoring species in multi‐species, multi‐threat systems’. 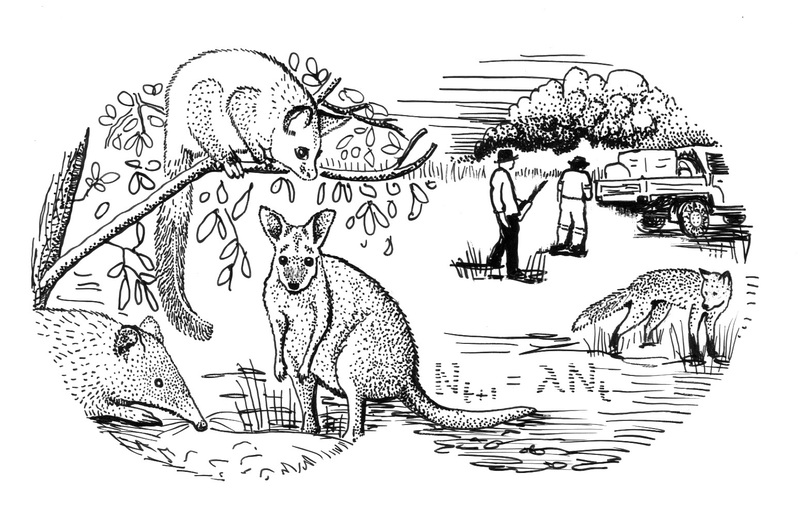 This entry was posted in Conservation and management, Methods papers, Statistical methods and tagged biodiversity, conservation, Expected Value of Sample Information, Extinction, Multi-Species Systems, Multi-Threat Systems, Species Monitoring, Surveillance Monitoring, Targeted Monitoring, Value of Information, Wildlife Management by Chris Grieves. Bookmark the permalink.